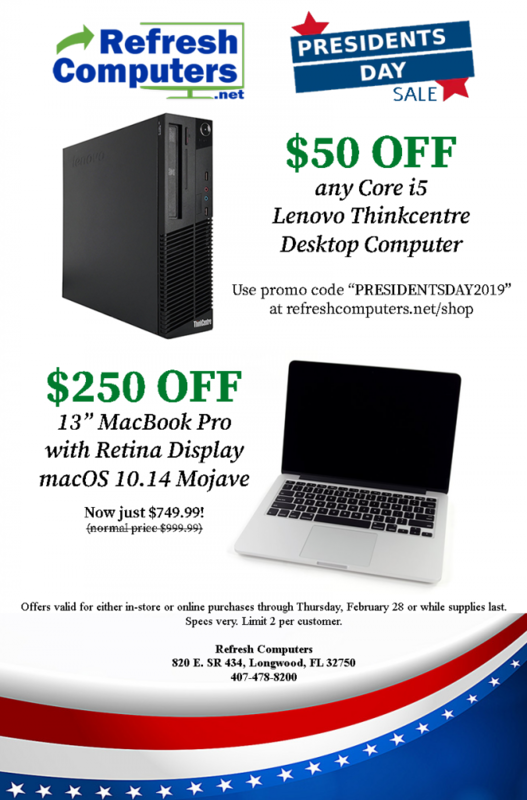 Home / Refresh Computers Presidents’ Day Sale! The Refresh Computers Presidents’ Day sale is here with these dignified deals just for you! Through the end of this month, take $50 off ANY of our Core i5-equipped Lenovo Thinkcentre desktops with Windows 10, or $250 off a MacBook Pro with a 13″ Retina display and the latest macOS 10.14 Mojave! These offers are valid through Thursday, February 28, 2019, or while supplies last. Limit 2 per customer. Call 407-478-8200 or visit our Superstore location at 820 E. State Road 434 in Longwood to take advantage of these great deals today!